Threes want to do everything. Learning is hands on and experiential. They are explores, builders, painters and engineers. They are willing to fully immerse themselves in learning and get dirty in the process. The Threes program is organized thematically, enabling children to make thoughtful connections and comparisons from their own observations, explorations and experiences. Utilizing the “project approach” through both long and short term projects, children will be given opportunities to explore art, science, math, language arts, sensory materials, music and movement and bi-weekly chapel. 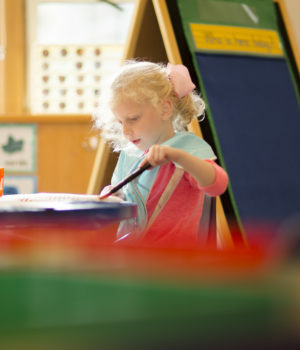 Children will be exposed to developmentally appropriate learning centers as well as small and large group activities. As threes build comfort in the classroom, with the materials, and their peers, they build their confidence and readiness to learn. This is the true work of childhood. The Threes class attends chapel biweekly.